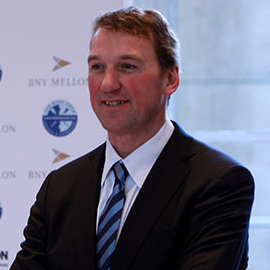 British rower and Olympic speaker Sir Matthew Pinsent CBE is one of the UK’s most successful athletes ever with no fewer than 14 gold medals – four consecutive Olympic gold medals (one of only five athletes to achieve this) and 10 world championship gold medals. If you are seeking the finest Olympic rowing stories, Matthew can give his unique insight into the sport which has been his life for some time. Almost certainly his greatest moment was when he was part of the Team GB coxless four who won the gold medal at the 2004 Olympic Games in Athens. What was so incredibly exciting was that Pinsent and his team mates Steve Williams, Ed Coode and James Cracknell were just eight one hundredths of a second in front of the Canadian team at the end, having been behind with 90 per cent of the race over. Such are the fine lines between becoming a history-making Olympic champion and just being remembered as the athlete who nearly made it. Matthew’s winning ways have been linked closely with his partner in the coxless pair Sir Steve Redgrave, also a highly popular Olympic speaker who can be booked through Champions Olympic Speakers. The pair won gold medals in 1992 and 1996 and joined up with Tim Foster and James Cracknell four years later to win yet another gold. They also won seven World Championship golds together and then Pinsent who was given an MBE in ’93, formed another incredibly successful pairing with Cracknell, coming first in the World Championships of 2001 (twice – one coxed and one coxless) and 2002. Rowing speakers like Matthew offer a unique insight into putting everything on the line, pushing through the pain, and finishing above all else. He has some truly remarkable stories to tell about one of the most glorious – and painful sports in the world. To book Olympic rower, Sir Matthew Pinscent CBE to make a personal appearance at your corporate event, function or conference, simply contact the Champions Olympic Speakers agency by filling in our online contact form. Alternatively, call a booking agent directly on +44 1509 85 29 27.